This year the number of Partly Free countries has gone down to five: Tunisia, Lebanon, Morocco, Libya and Kuwait. 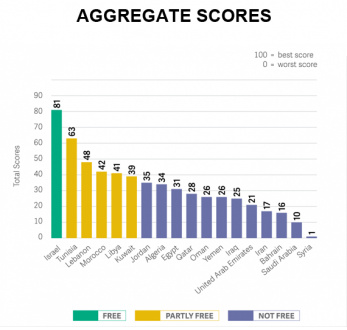 Countries in the ‘Not Free’ category this year are: Jordan, Algeria, Egypt, Qatar, Oman, Yemen, Iraq, the UAE, Iran, Bahrain, Saudi Arabia and Syria. The PA controlled territories and the Gaza Strip are also defined as ‘Not Free’. Two additional countries defined by the BBC on its website’s Middle East page as part of the region are Mauritania and Sudan, both of which are also categorised by Freedom House as ‘Not Free’. As we noted here last year, one might perhaps expect that at least two of the BBC’s public purposes would have the effect of focusing the corporation’s coverage on states which do not have independent media of their own and on informing BBC audiences of issues relating to the absence of political and civil rights in far too many Middle Eastern countries. But is that actually the case? The data we have gathered here over the last year shows that in that period of time Syria (Not Free) has received the most exposure and coverage on the BBC News website’s Middle East page – almost exclusively in relation to the civil war which has been raging there for nearly four years. The country receiving the second most coverage in 2014 was Iraq (Partly Free) – mostly in the wake of the rise of ISIS there. The third widest coverage and exposure was given to the one and only country in the Middle East defined as ‘Free’: Israel. Egypt, which in this year’s Freedom House report moved from the ‘Partly Free’ category to the ‘Not Free’ category, came fourth in terms of coverage and exposure on the BBC News website and Iran came fifth, with the bulk of BBC coverage relating to the P5+1 talks rather than to internal affairs. If we compare the BBC News website’s coverage of Israel to that of the ‘Partly Free’ countries it defines as making up the Middle East we see that Israel (‘Free’) received more coverage than all of those five countries put together. 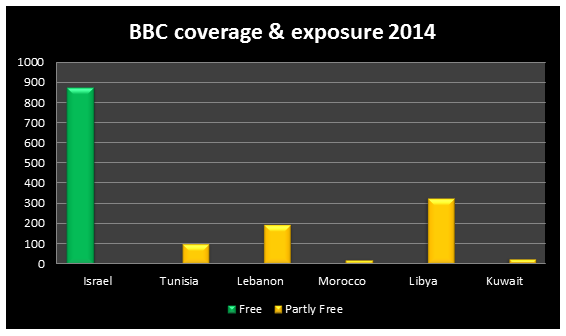 Countries receiving the least coverage on the BBC News website’s Middle East page in 2014 were Mauritania (with zero coverage) followed in ascending order by Sudan, Oman and the United Arab Emirates. All those countries are defined as ‘Not Free’. Among the ten countries in the world described by Freedom House as the “worst of the worst” – i.e. having received the lowest possible score for both political rights and civil liberties – are three which appear in the BBC’s definition of the Middle East: Sudan, Syria and Saudi Arabia. Israel received over two hundred times more coverage than Sudan and over four times more coverage than Saudi Arabia on the BBC News website’s Middle East page in 2014. 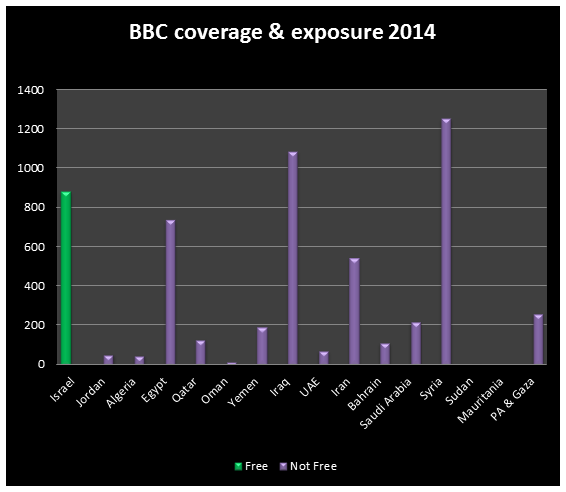 Comparison of the coverage of Israel (‘Free’) with that of the ‘Not Free’ countries and territories shows that with the exception of Syria and Iraq, Israel received more coverage and exposure than all the other countries/territories. As we have noted here before, an issue arising from the 2012 report commissioned by the BBC Trust on the subject of the ‘Arab Spring’ was that of excessive focus on one particular Middle East topic. BBC News website coverage of the Middle East in 2014 shows that once again the editorial policies which brought about that conclusion have not significantly changed and that a disproportionate focus on the one free country in the region remains a characteristic of BBC reporting. We have on several occasions noted here that the BBC refrains from reporting on internal Palestinian affairs and that as a result its audiences are not adequately informed with regard to the status of the political rights and civil liberties of Palestinians living under Palestinian Authority or Hamas control. The same observation is true with regard to many other regimes in the Middle East, with several of those having the worst records continuing to receive the least BBC coverage. Meanwhile, senior beeboid anti-Semite cokehead born-again-Jew Stephen Fry has today announced he is to marry his long-term partner Elliott Spencer. Presumably he is, thank goodness, marrying out of the faith. Apologies; Elliott is not Stephen’s long-term partner. He only met Stephen last year, after Stephen separated from his long-term partner five years ago. NB. It appears Stephen is 30 years older than Elliott. I suspect a searching under the lamp post effect operates here. [Looking for your wallet where the light is better rather than where you lost it.] Reporting Israel is easy — first world services and conditions, limited censorship, little likelihood of violence against journalists. Reporting Syria and Iraq could be very dangerous.